Preheat grill to medium-high heat. Spray watermelon slices with nonstick cook spray and lightly season with salt. Grill for approximately 1 minute per side, until grill marks appear. Let cool completely. Cube watermelon into bite-sized pieces. In a large serving bowl, drizzle arugula with a little extra virgin olive oil and lightly season with Kosher salt. Toss to coat. 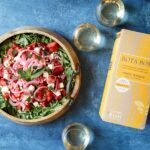 Top with grilled watermelon, feta, pickled onions, pine nuts, and mint. Right before serving, drizzle with balsamic glaze. Devour.